One thing I don't understand, I hear many say that they won't use a GPS and only rely on a map and compass, because they say the map and compass are far superior? I feel confused when I hear this. I don't know if I'm missing something here? I even came across a website which gave one of their experts a GPS and the other a map and compass, to test effectiveness. The guy with the GPS took so much less time finding where to travel versus the lady with the map and compass, especially when on the "off-trail" section of the test. However at the end, the website's guy expert said he would hands down use the maps and compass over a GPS if he was forced to choose between the two, because you don't have to worry about batteries or reception. One thing I'm very confused about: GPS critics say if you're at the bottom of a narrow canyon or under thick vegetation, the map and compass is better because of reception? So what I don't understand, in order to find where you are at with just a map and compass, you need to find landmarks in order to triangulate. Half of the time when I'm out hiking, the trees are high enough I can't see any landmarks to triangulate with the map and compass. However, when I pull out my Garmin Oregon 450 GPS, it tells me exactly where I'm at and says it's within 15 ft accuracy. I can understand the concern about GPS reception if you're on the north face of Mount McKinley in Alaska where you're further north than where the GPS satellites pass by, affecting your signal, but for general use within the Continental U.S.? I also notice that taking bearings and heading to a place with a compass only works if you have landmarks along the way to keep yourself in a straight line, but half of the time the trees make that difficult; the same for taking back bearings with a traditional compass. Other things about when I use the traditional map/compass: Subtracting or adding 5 degrees from a compass bearing to hit a "handrail" to follow to a waypoint often takes me through weird terrain to get there. Then also when it's pitch dark and I'm on a trail which hasn't been maintained in 30 years, it's difficult to find my way back, and impossible to take bearings with the compass mirror sight. On the other hand, my GPS is easy to see in the dark and I can just follow my "track" back to where I had come from (very easy). I don't fear running out of battery because I usually carry three backup pairs of batteries, and check their charge before my next outing. Map/compass supporters say you may drop your GPS and it'll break, so use the map and compass instead? For a while I had a protractor compass in my backpack, but then from all the pressure the liquid would leak out of it, to the point of making it so taking bearings wasn't accurate anymore. My Garmin Oregon 450 is rubberized and I've dropped it on rocks so many times and it still works, even if I don't like the scratched rubber look. I upgraded from the thrashed protractor compass to a mirror sight compass you can fold over to stop that pressure on the encased liquid compartment, but I still feel skepticism. Is that legitimate skepticism? The only reasons I carry a map and compass for backup is because it's always possible the Garmin could have software issues, and USGS maps tend to be more detailed/much easier to scroll across than the GPS maps. I'll use the compass for finding out which mountain peaks in the distance are which, because I find compasses more accurate than the electronic GPS compasses if you're not actually moving. Is there something I'm missing here about why there are all these people who prefer the map/compass over hiking GPSr's. I'm just trying to become a more educated navigator. Re: Which is better: Map and Compass versus GPS? Which is better is a useless question. Is ice cream better than cake? As you have noted each technology is better at some things than at others. It's pretty obvious. It's just that I hear so many people telling me I shouldn't bring my GPS when I hike to save on weight, and to use a map & compass instead so that I don't get lost. I feel confused by that, so I was asking this question here to see if it's just their own personal preferences/opinions or if there's anything I'm missing? I do bring a map and compass as backup, but use my GPS for most all of my navigation. Mostly, it's people beating their chests, mocking you for "cheating" and/or "laziness" when you should really "man up" and master the skill of map-and-compass. ("Like I did, and dad did before me, and grandpa...") Well, guess what? I do gps AND map-and-compass, and it still bothers some people. Pay no heed. I always carry a compass (and sometimes a map) with me but use the GPS for navigation. However, realistically I've never truly needed either to get where I was going (except a canoe hiking trip). In my opinion if you're doing some really "planned" trips the GPS and a paper map are the best combination. Use the GPS to get exactly where you are (in UTM or MGRS since you can really accurately find that on the paper map) then you have a large view of where you are going rather than the small screen. Really the only problem I've had with GPS is that in Alaska it can get cold and the batteries get pretty unhappy. To address your bottom of a canyon question: Old GPS units had a real hard time in that environment but its much less of an issue these days. 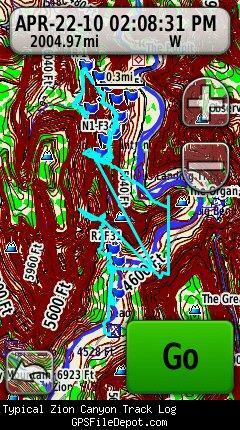 The return question is: if you're in that narrow of a canyon do you really need either a GPS or map/compass? With a map/compass in a deep canyon you'll have nothing to reference so you can triangulate your position. However, mainly you're in a deep canyon: keep going forward or go back. I haven't had as much success as OZ with any of my GPSrs in my local canyons. If I can't get a clear view of the sky my tracks wander all over the place. Grand Canyon Rim to Rim -- 62s was a qualified maybe. North Rim to Phantom Ranch tracklog added two miles to actual 14. Track log left the trail lots of places. Zion -- Angels Landing or Observation Point -- 60csx, 62s, OR300, Etrex30. All were pretty much a waste with some track points 1/2 mile to 1 mile off the trail. This image is from a OR300, but the other GPSrs were no improvement. Bryce Canyon (not really a canyon an amphitheater) -- generally OK with all my GPSrs, except for Wall Street and the Navajo Loop, which involve true slots. If I were doing true canyoneering, I'd want a reliable distance measuring device, a map, and a compass. I wonder what John Wesley Powell used. In his journal he indicates he recorded his positions very accurately when he went through the Grand Canyon. I've never used a GPS for camping/hiking. Topo maps or dead reckoning has always brought me to where I need to go. In aviation, that's becoming a huge issue. Many pilots I've spoken to have only ever flown in aircraft with GPS units. I asked a guy what he'd do when his GPS fails, and they do quite often. He had no idea how he'd complete a flight. I didn't learn to fly that long ago... maybe four years ago now, but I didn't touch a GPS unit for the first year. We used a map, a compass and a clock. When you hit your checkpoint +/- 30 seconds, it's a good feeling. Personally, I find it's more satisfying to navigate the "old" way sometimes, be it in the air or on the ground. A map will never run out of batteries. A map will never stop for ten minutes trying to "acquire satellite signal..." If you drop a map on the ground while getting out of your truck, it won't break. I've never used a GPS for camping/hiking. Since the whole purpose of this site is making/distributing maps for GPS devices, you are clearly in the wrong place. Obviously, a GPS is no replacement for common sense and basic navigational skills. It is a tool that can be very useful however. It is a tool that can be very useful however. A routable trail map can tell you how far it is between you and your next beer. This brings back memories of my old high school Calculus teacher. He didn't mind us using calculators IF we could first prove that we could work out the problem on paper. One could apply this thought to map/compass and GPS. I train with my K9SAR team quite frequently in and around the Catskill Mountains of New York. The region is infested with iron ore which will at times make the best compass useless. This is where reading a topo map, knowing how to read the terrain, line of sight, and pace counting all come into play. Our team likes the Garmin astros with a Garmin dog collar as it identifies both the handler and K9's locations, which when downloaded to a program like terrain navigator paints a nice picture of the ground that was covered. We still carry and use the compass to keep the skills honed. GPS' like anything electronic can and will fail, often when you need it the most. Best of Luck! This brings back memories of my old high school Calculus teacher. He didn't mind us using calculators IF we could first prove that we could work out the problem on paper. If we applied his philosophy to GPSFileDepot, we might say it's OK to download maps here, but only IF you can also make your own map. IMHO no one should venture into the back country without basic orienteering skills and a good laminated topo map. One should be able to find cardinal directions without a compass, know where to look for water, and have the ability to make a fire. Unfortunately we live in a day and age when people will let GPS and other forms of technology substitute themselves for common sense and basic skills. The GPS is a superior nav aid but it does not in any way replace orienteering and survival skills in the back country. A thinking man is never lost for long. Map and compass. Period. A friend of mine has tried desperately to get me to venture over to the Dark Side, but I've resisted ... so far. I like to go into the mountains to get away from technology, not to depend on it. If I'm camping for a few days, I might bring my iPod or a small radio, beyond that, I'm tech-free when hiking/camping. And as thorold so eloquently put it, compasses never become outdated technology which need replacing. I can understand the appeal of a GPS, but it's not for me. GPS is like flashlight. Convenient, easy to use but depends on batteries, can be broken and dulls your senses at night. Do you take a flashlight with you?